Additionally, she also happens to be a very special friend, and most recently she became my sister! Yes, less than two weeks ago, my brother married this beautiful woman! My husband and I were lucky enough to be able to stay in their area for the week after the wedding, and therefore I got to experience her ethereal head wraps. These photos were taken during the sheva brachot (meals eaten for the week after a Jewish wedding), one for each day. The only one we didn’t get was from Friday night (day six) where she paired a colourful sari scarf wrap with a black dress. And finally, Day Seven – taken after Shabbat! So yes, her wrapping skills are out of this world and she is a stunning woman. However, she is so much more than these pictures can even begin to convey. You’ll see. I will now hand the writing over to Naomi so you can get to know her better. My name is Naomi and I didn’t grow up religious. I want to write about hair covering, not my spiritual journey, but I felt I had to put it on the table. A lot of the practices of orthodox Judaism don’t mesh very well with secular American culture, and hair covering is definitely one of them. 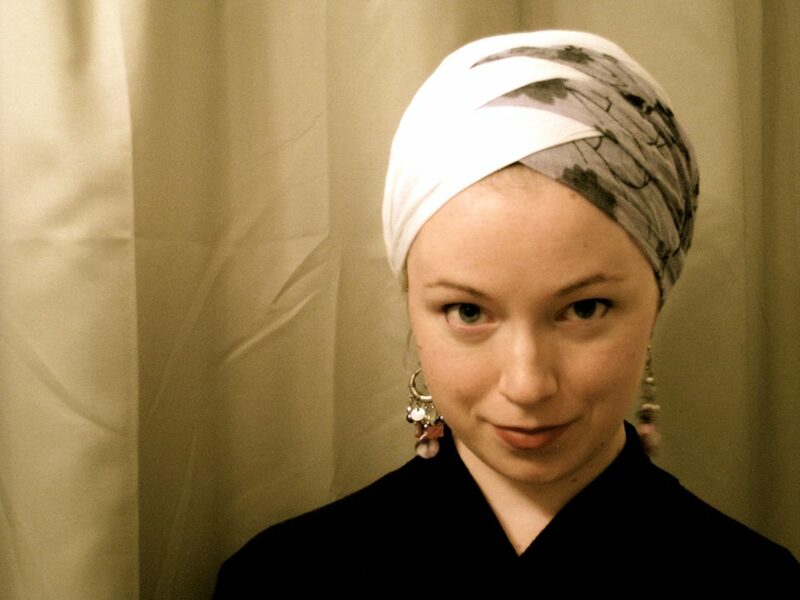 When you grow up identifying as an observant Jew, most people understand, even if they don’t agree with your religious reasoning, that you have a cultural practice of covering your hair. However, when you decide to become religious later in life, things become more complicated. For the rest of your life, you will have one foot in your new, observant Jewish community and the other foot at home with your non- (or less-) religious family and childhood friends. If you want to preserve your childhood and family relationships, you have to be ready to explain why you would obligate yourself to do all these frustratingly complicated things when you could have had a perfectly easy life by staying just the way you were. 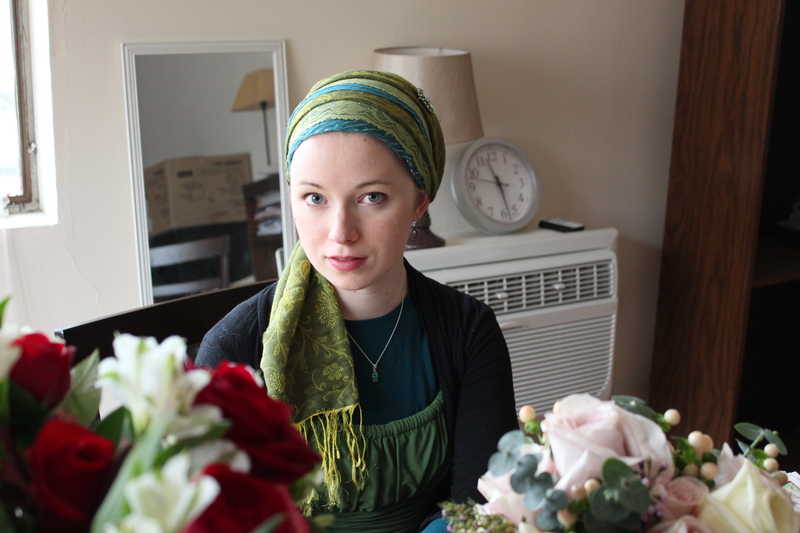 Andrea and many other married Jewish women liken covering their hair to wearing a crown. Now that I’m doing it, I think this analogy is apropos on more than one level. It’s not just that both crowns and scarves are beautiful and royal-looking. It’s that by covering my hair, I become a public figure: a visible ambassador of an entire culture. To my non-Jewish friends, colleagues, and even to strangers, my behavior gets filed under “How Jews Act.” Like a queen’s crown, a judge’s robe, or a policeman’s badge, my head covering is not just an accessory. It has weight; it puts me under scrutiny. I carry on my head the heavy responsibility of giving people a positive impression of Judaism. This certainly didn’t sink in for me right away. Even before getting engaged, I was spoiled rotten as far as preparation for hair covering goes. I poked through all of Andrea’s posts and videos. I sneakily collected scarves for months from thrift shops and piled them in a box at the back of my closet. When I was stuck at home doing laundry, I would have a complex, fancy triple-scarf wrap on my head just because. At this point, I loved hair covering in the same way that I loved cute shoes or nail polish. It was FUN, and I quickly became pretty good at it – even though I was secretive to avoid scaring my not-quite-fiancé. This period of girlish excitement persisted through most of our engagement, until about two weeks from the wedding. One day, I looked at myself in the mirror, and I realized that married me could never leave the house without a hair covering again. And then the old righteous I-should-be-allowed-to-do-whatever-I-want instinct and the why-should-“organized religion”-tell-me-what-to-do instinct kicked back in. I hadn’t heard from either of them in a while, but we all deal with them. Even those of us who stand strongly by the decisions we’ve made. It’s part of human nature to fight against obligations and limitations that make our lives more difficult, and maybe even more so when the only one to blame for the obligations is ourselves. While I struggled to make peace with hair covering in the little time remaining before my wedding, other parts of my Jewish life blossomed in ways I had never imagined. The community around us came together and literally made our wedding. In the same sense that people say “it takes a village to raise a child,” it took our whole village to marry us. Our food was home-cooked by a couple of powerhouse local women who’ve personally catered over 150 weddings for couples who are still students or just starting out financially. Our florist lent us 30 vases and gave us a bunch of floating candles for free. I bought my dress for next-to-nothing from a Jewish vendor on Etsy who was getting rid of old inventory. Friends from the synagogue drove us around everywhere on errands since we don’t have a car. Never before had I felt so welcome in the Jewish community, but I still had difficulty with the notion of becoming so visibly religious. What eventually helped me reconcile all of these feelings was this: When someone you trust with your life gives you a piece of advice, even if that advice is very strange, you don’t throw it out immediately. It might be hard. It might not fit the picture of what you grew up with, or what’s popular right now. Though the advice isn’t easy to take, the source of the advice is so important to you that you’ll follow it anyway. When we’re little, we think we should be allowed to eat cookies every day. Maybe we even have a friend down the street who does eat cookies every day and we resent the carrot sticks that we get in our lunches instead. But in the end of course, our moms were right – the carrots are healthier. We just weren’t in a place, as children, to understand. My G-d and my community, collectively, represent a force of kindness, caring, and pure knowledge far greater than I possess alone. Even though it is hard to look different, hard to explain to someone on the street, when a piece of wisdom comes from Judaism, I listen. The morning after my wedding, I did that same fancy triple-scarf wrap that I’d secretly worn while doing laundry. It used to take me five minutes. That morning, my hands shook and it took me over twenty. My husband was looking on in curiosity, but I had to ask him to go away because he was making me even more nervous. In the end, covering my hair has been both easier and harder than I thought and feared it would be. In this and many other areas of Jewish life, I am still very much a child. I struggle with wanting to eat cookies instead of carrot sticks. But the weight of the queen’s crown, the responsibility of my visible presence as a Jewish woman, reminds me that I must make the best of myself. I’ve only been married a week, and already I’ve made a concentrated effort to greet people with a smile (Should a stranger’s only contact with an observant Jew consist of a distracted frown?). I try to show up earlier, tip more generously, and listen more attentively so others know that I value them. It takes effort to push myself like this, but I’m so glad my covered head is forcing me to do it. It is tempting to live life pursuing comfort instead of growth. But if you stay comfortable, you will never find your full potential. Cover your hair beautifully, with inner commitment, and you will literally turn heads in the street. You are in the limelight now. It isn’t going to be comfortable at all, but you just might change the world. Extremely insipiring and so true. 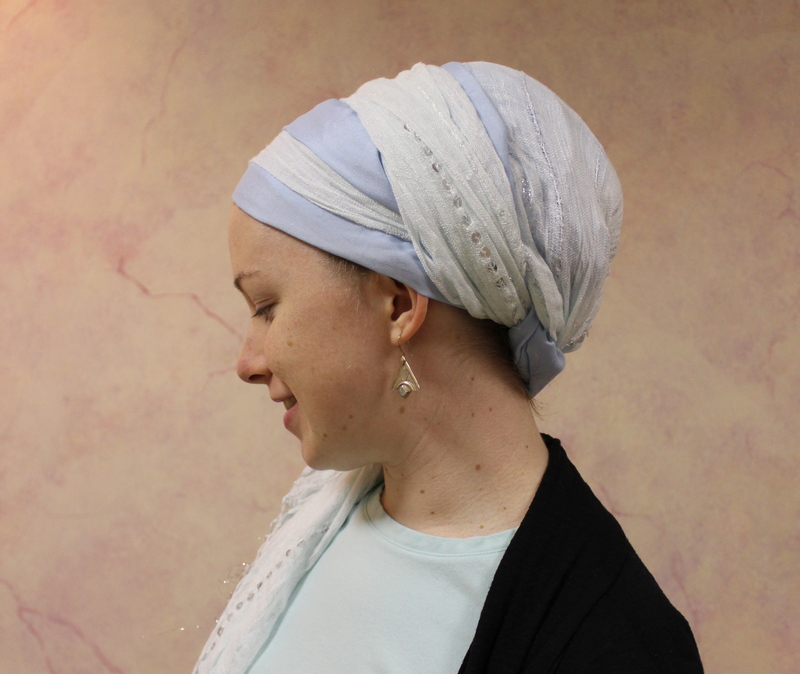 You express what most of think, whether or not we are Jewish by birth or by choice, or cover our hair for many other reasons. Thank you for sharing and good luck for your journey. Beautifully put. I will carry those first 2 lines of that last paragraph in my mind — applicable to so many things in life. Best wishes to the new bride! She’s another Vermeer painting, Andrea! Seriously. Those photos are just purrrrrr Vermeer! My only question is what’s undiscussed: can you tell us about her husband, your brother, Andrea? I believe you once said you were a Jew by choice too. If I’m not wrong, then did your brother follow suit as well? Different topic for another day I know, but just curious b/c it’s fascinating to me. Hi Elisheva – I’ll answer this one. 🙂 Andrea’s brother Zev and I are both converts. We actually were both pretty nonreligious when we met and gradually we learned about Judaism together. Yes, the whole story is a continuous miracle. My brother grew up with Judaism (like me – the whole story is on andreagrinberg.com) and Naomi did not. What a wonderful personal account Naomi. I feel honoured for this glimpse of your thoughts/feelings. I also adore the ‘shades of green and cream’ you are wearing in that last photo. Naomi, congratulations on your wedding. Your post is beautifully worded. Your wraps are beautiful. You are an inspiration for Jewish women and non Jewish women. Your last sentence is so very true! Oh my dearest Naomi – thank you for such a beautiful post. I feel so blessed to have had a peek into your mind and heart during this exciting and sacred process. I was SO intrigued by your criss-cross photo, and was more than eager to see how tichels would look by your hand and with your artistic aesthetic. Thank you Andrea for your continued support and advocacy for this beautiful/monumental/sacred act. If I wasn’t on a Boston subway right now, I know that my eyes would be wet. Thank you. Thank you, many times over, for sharing this! This explained very well one, of what must be many reasons, for hair covering. I appreciate also hearing this from a converts point of view (since I am studying Judaism now myself). Congrats on your marriage! Another happy, headcovering convert here! Mazel tov on your wedding. You are amazingly beautiful, inside and out. I’ll be cross posting this entry to all of my friends. Thank you so much for the inspiration! Thank you, THANK you for this post – both of you! The kedusha is just shining off the screen. As the token almost-giyoret (I’m to the point where next time I meet with the beit din, I have promised myself I will outright say it would be CRUEL to have me go through another Shabbat in limbo), this gives me chizuk and hope that there is a light at the end of the tunnel. ❤ Keep using that power of inspiration that you (both) have! Thank you for your inspiring words. I love how the women here express the specialness of being covered.Wishing you many years of happiness. Congratulations! How beautiful. You are doing quite well with your wrapping and your story is so nice. Thank you for sharing. Mazal tov, Naomi. The Jewish People is fortunate to have you in it. I remember putting on my scarf for the first time after my wedding- we had a late morning wedding, so we came back, showered and napped, and then went to try to find dinner around 9pm. I didn’t do anything fancy- that wasn’t in my “vocabulary” at that point, but the adjustment from “trying it out” to “this is real, and a real choice” was palpable for me as well. 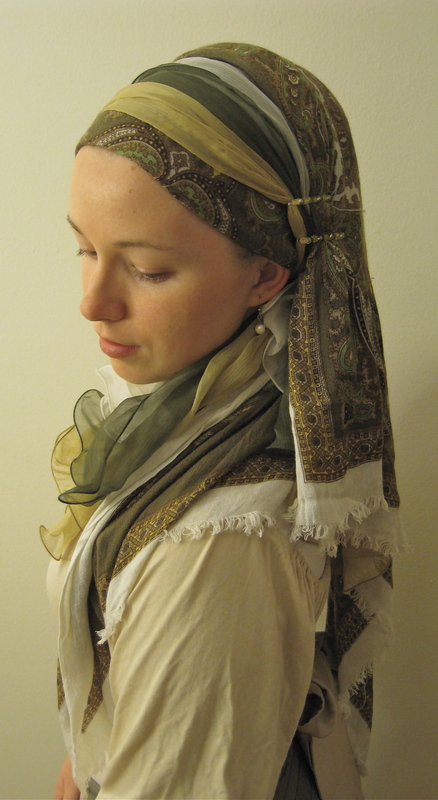 Would love for you to give me “hands-on” lessons using scarves – beautiful and eloquently done! Beautiful story, i would love to see some how to videos. Especially for day one and seven!!! PLEASE add links for how-to wrap all these gorgeous styles! Naomi, congratulations on your wedding and thank you for sharing your thoughts. Andrea, thank you for asking Naomi to write this article. Mazel tov and I wish you only happiness and brachos on your married life ! Thanks for sharing so penly what you live, what you convictions are…You are a real princess, a “Bat Mele’h” in the highest meaning! BH for all this, wish you a happy life with you husband! Mazal tov again! so inspiring, Naomi. Mazal tov on your marriage. I am shy by nature and sometimes I’ll go to a new shul where I am not a regular but then I remember that from the perspective of many of the congregants there I am the “frum” one so even though I feel like a newcomer and people should reach out and be friendly to me, I realise that if I don’t go over and greet people and make them feel welcome then the whole of Judaism would be judged as a cold, unwelcoming religion. It’s a tough position to be an ambassador at all times but you summed it up so beatifully in your post reminding us that that is exactly what it’s supposed to be. Thank you. I wish you and Zev lots of blessings in building your bayis ne’eman b’yisroel. First of all, you are beautiful and your wraps are beautiful. I particularly love the last one in green and the 2 purples!!!!! I would buy those in a heartbeat. You have a lot to teach us—-thanks!!!! Years ago, when I (born of anti-religious Jewish parents) took on traditional practice and covered my hair when I married, my family — especially my mother — reacted with horror. I encountered tremendous resistance, anger, ridicule, and more. It was basically, “What?! Why would you set the clock back to those ignorant, primitive ways? We’ve come so far since then.” The word “orthodox” was uttered in disdain. And the last sentence I quoted above, about being ready to explain, was totally applicable in my case. In fact, I’d say it was more like I needed to be ready to just quietly keep going in the face of intolerance from my own family, because they were closed to any explanation whatsoever. Most non-Jews I encountered didn’t know enough about Jewish cultural practices to understand. So to them, I did plenty of explaining, and frequently still got the “setting women back 500 years” reaction. So I have to gently disagree with your sense that “most people understand.” Not so, in my experience. Yeah, you are very right. A lot of BT’s have to deal with not only ignorance, but passionate resistance. I have found a lot of this has to do with their own level of religiosity, and some deep feeling of guilt that they aren’t doing more and therefore feeling threatened that you are now “more Jewish” that they are. However, what Naomi is saying that when you are born Jewish (even if not religious), you can at least say that you are “looking into” your heritage, yknow? But you are right, in many ways, we (I am both a BT and a convert!) are in the same boat! Basya, you are right – this is a very important point, so thank you for bringing it to the table! I guess when I wrote “most people,” I was thinking of the sum total of people whom I encounter outside of my Jewish community (e.g. co-workers, fellow students, people on the street), most of whom are non-Jews or nonreligious-but-openminded Jews. Anti-religious Jews, especially family I imagine, would generally be much harder to speak to about head-covering and other issues! I find the key is in sensitive discourse. Obviously with family who have very strong emotional opinions about these things, there is only so much you can do. But one thing I find useful is to figure out WHY exactly Person X that I am talking to finds hair covering to be “ignorant and primitive,” or anti-feminist, or what have you, and then go from there. They will feel like you’re trying to get a sense of where they’re coming from, which makes you allies rather than enemies. Often I have found that what lies behind deep anti-religious feelings is: A) a misconception about what the religious concept in question really means, or B) Fear/indignation stemming from an assumption that you are judging them for not also being religious. Your crown must be particularly heavy. Kol hakavod for holding your head high anyway! Beautifully written!! Is there any way I can learn the art of tying the wraps in my hometown Lkwd, nj. Absolutely love it!! Pingback: Sisterly Love! | Wrapunzel ~ The Blog! Congratulations! I really like the 3rd style, and would love to see how you did that. Maybe the type of scarf is the secret? I’m a little late to the conversation, but I so identified with this article and the many wonderful comments. I feel such encouragement from this blog and all of the wonderful Wrapunzel ladies and followers. I’m a Christian who has just begun full-time head covering in response to the Old Testament, 1 Corinthians 11, and church history through the ages. Christian women didn’t stop head covering until quite recently, but it’s such a foreign concept to us now. There is a growing head covering movement which I’m very happy to see, but usually, if a Christian woman decides to cover, she’s the only one in the church to do so. I’ve gotten a couple of comments from Christians, one that seemed to lean towards the legalism argument. My husband supports me in this effort but didn’t really jump into exploring it with me. My sister and niece were curious but no one has really made really mean comments except for my mother, who always has to make some comment about that “thing” or “rag” on my head. She wants me to show my hair, which to me is confusing, because I don’t have pretty hair. It’s thin and fine and I usually cut it short because it gets so scraggly. In photos, I think I look far better with covered hair. I thought I’d get far more comments, but it seems that covering one’s head has become something of a trend, lately. In all honesty, for those who are negative, I thought it would be far easier to be able to simply say it’s a cultural call to modesty and saving my hair for only my husband, but I can see now that covering one’s hair is difficult no matter the motivation. Well, I’ll just say that we should be strong and cover on! Amy, you’re right. I’ve been the “Lone Coverer” in many churches. I’ve been covering in Christian churches for 25 years so I think I’ve heard it all by now. When the “legalism” word is thrown at me I usually ask what other part of the New Testament are we to obey or disobey? We obey the 2nd half of the same chapter (1 Corinthians 11) like our lives depended upon it. It’s read in churches almost every weekend. There are many ideas about what constitutes legalism but following the New Testament is usually not one of them. I run some online groups to support those who are the only coverer in their churches. I’ve worked very hard studying that passage in the Greek (the original language used there) and I’m ready to help you in any way I can. Reply again here and we’ll see how we can exchange emails or something. We don’t want to offend the inter-faith aspect of headcovering here. This is not a case of I’m right and you’re wrong. Andrea has done so much for those of all faiths and probably those with baldness issues too. Her products are the best too but what won me over to her a few years ago was her smile, her attitude, her willingness to teach and not judge. She’s the greatest!! But if I can help you with my studies I’d be happy to do that. You can apply to Prayercoverings3 which is one of the Yahoo groups I run or to Headcoverings. Both yahoo groups are to give support to coverers, nothing more.